The staff was very friendly and helpful. The sites have little privacy or landscaping, but most have views of the beach and the wonderful sunsets which more than makes up for that. The sites are mostly level and all of the hookups worked fine. We especially liked having a garbage can at every site hidden in an enclosure. There was a large grassy area nearby where the dog could run off leash and no one seemed to mind. It was very quiet at night. We would definitely stay here again. 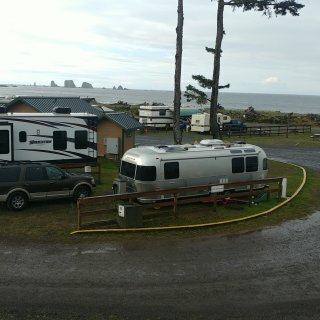 We camped at Quileute Oceanside Resort in a Travel Trailer. The only restaurant in town has good food and service at reasonable prices. There is a large window with a view of the ocean. It is about 16 miles to the nearest supermarket although there is a small market at the campground. I recommend bringing adequate supplies for your stay. There are numerous scenic areas within a short drive of La Push. Our site had the best view of the ocean in the park. It was also reasonably private because the adjacent site was considerably higher and there was thick vegetation. Because of the steep hillside and narrow road it was a bit tricky backing into the site, but it was worth it. The beach was a two minute walk away and chairs on the street side of the trailer had a fantastic view of the sunsets. The owners were friendly and even upgraded us to this site, if we wanted it, before we even arrived. Great Dish satellite reception. The park is clean, pleasant, and well maintained. We camped at Sea and Sand RV Park in a Travel Trailer. The beach at this park is beautiful and very convenient. About a 5-minute walk to the north there is the Cafe C'Est La Vie on Bella Beach Drive. Wonderful coffee, crepes, and other breakfast items in a cozy environment. There is also outside seating in a beautiful neighborhood. It is worth the walk. The owners of the park are friendly and helpful. We stayed in site 19, a back-in site. The sites are large but there is no barrier between them. They have a nice grass area behind all of the back-in sites with fire rings. We were able to leave the tow vehicle hitched to the trailer with room to spare. We camped at Riverview RV Park & Storage in a Travel Trailer. We stayed in Site 4, a pull-through with full hookups. The site included a gas barbecue grill, a table with chairs, a picnic table, a fire ring, and a swing. There was a patio and a spacious grass area. The camp hosts were wonderful. They were friendly and helpful from the time we checked in until we left. When the store was out of eggs they went to their own refrigerator and brought us two eggs for free. There is a very nice dog park and a trail to the beach. The beach is nothing special but the dog and I enjoyed a nice morning walk there. There are many activities available in the park, far more than we are used to seeing. Our site had excellent satellite reception, but many sites were in the woods and would not. We would definitely stay here again. We camped at Bay Center / Willapa Bay KOA in a Travel Trailer. Do your shopping before arrival. About one half mile down the road there is an oyster store with fresh oysters from the bay. The office has many tips on nearby activities. The check in process was easy and the people very friendly. It was a bit confusing to figure out the site numbering system, and as it turned out we parked our tow vehicle in adjacent site, but no one complained. The sites are on gravel with some grass. They seem to be level. Our site was a bit small but not an issue since we have no slides and the adjacent sites were not occupied. Satellite reception was good and Verizon phone had good signal. They charge for Tengo internet. The best feature of the park is that it is adjacent to a beautiful beach which is almost deserted. Our dog loved it. I plan to stay here again. 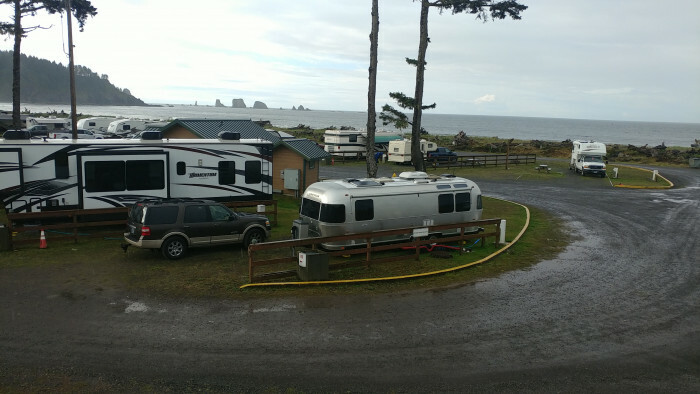 We camped at Sunrise Resorts-Copalis Beach Park in a Travel Trailer. It is a short drive to Ocean Shores and all the amenities available there. There is a small market across the street, otherwise it is about ten miles to large supermarkets. Many nice tourist towns in the area to visit.